The very idea of people being able to leave comments on an ad can take some getting used to, particularly for those in risk-adverse categories. The good news is, as long as you plan and prepare for those inevitable killjoy comments, you’ll be just fine. There are plenty of things you can do before and during your campaign to minimize and even benefit from those pesky negative comments. The biggest problem with negative comments is that they often catch you off guard. If this isn’t something that was discussed and planned for before your run, chances are you’ll be in reactive mode, which is where a lot of mistakes and bad decisions get made. Each comment then becomes a problem without a solution, which, in turn, spawns a chain of late-night texts and emails, or worse, an internal meeting the next day. Your plan doesn’t have to be complicated. My favorite plan: we respond to legit concerns and criticisms within 2 hours, if appropriate, but we ignore irrelevant or malicious comments. (Might even “hide” some troll-generated comments but more on that later). Even brands like Nordstrom’s and Southwest Airlines, brands that were built on customer service, get complaints and have unhappy customers. It’s the way they address those issues and complaints, their ability to turn unhappy customers into brand zealots, that make them stand out in their categories. So have a plan. If you’re an agency, have the tough conversation about the possibility of someone posting a link to your client’s competitor’s website sooner rather than later. Manage expectations. Assign people to handle feedback and figure their time costs into your budget and ROI calculations. Let’s put negative comments in their proper perspective. Receiving a negative comment does not mean you or your ad is a failure or that people don’t like your product or service. In fact, depending on how your organization deals with customer issues, negative comments can actually be an opportunity to address a common issue or answer a frequently asked question that many other potential customers may have. Even brands like Nordstrom and Southwest Airlines, brands that were built on customer service, get complaints and have unhappy customers. It’s the way they address those issues and complaints, their ability to turn unhappy customers into brand zealots, that make them stand out in their categories. 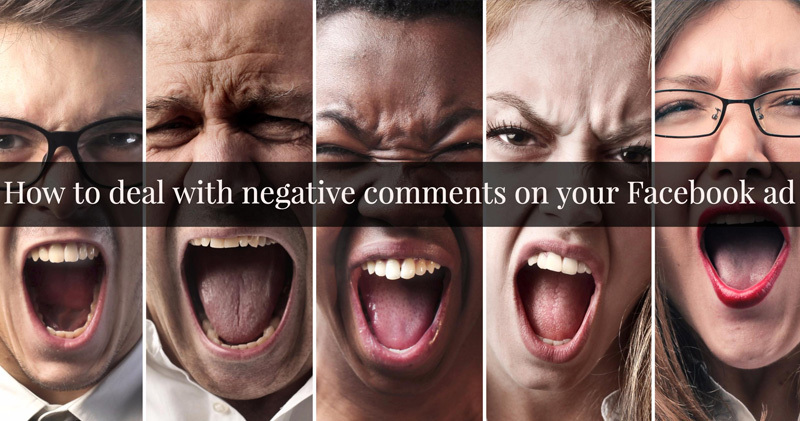 Another way to look at negative comments is to view them as free research. You can learn quite a bit about how your customers use your product or service and many times uncover problems or frustrations that you didn’t even know about. (You can also mine the comments section of someone else’s ad to use for competitive research but we’ll leave that topic for another day). More often than not, the reason an ad is receiving a lot of negative response is because of poor targeting. Lastly, remember that only a small percentage of people viewing your ad will read the comments. No one is focusing on that one terrible comment as much as you are. Are you delivering the Right Message to the Right People at the Right Time? More often than not, the reason an ad is receiving a lot of negative response is because of poor targeting. The ad has in some way violated the “Right Message to the Right Person at the Right Time” rule. I saw an ad last week for a healthcare finance seminar that was being targeted to a very broad, B2C audience(!) MF 18-65+ U.S. So, really, no targeting. The comments were brutal and left little or no room for anyone to have an intelligent discussion about the benefits of attending the event. Wrong People. Then we have this Kellogg’s ad, pictured below. Kellogg’s is still dealing with political fallout from pulling their ads from alt-right news site Breitbart, a well-publicized spat that spawned a grassroots #boycott of Kellogg’s products. Strategically, I like what they’re doing here. It’s a good time for them to be running this type of ad. Not a great time to talk about Snap, Crackle and Pop. But a good time to be talking about a corporate world view that includes caring a compassion. But I would say this is a case of “Right Message, Wrong Time.” I might have waited a little longer to run this (or any ad) on Facebook to a general audience. Or maybe tightened up the targeting a little bit. Or even excluded some audiences from the target. As you can see, many viewed this ad as an opportunity to simply trash the company’s policy, thereby keeping the issue in front of the public longer than it needs to be. In addition to tweaking your targeting, you can also help ensure a positive reception of your message by stacking the deck in your favor with a little Facebook hack that can work wonders. The idea here is to put your ad in front of people who already know, like, and do business with you by running your ad to customers (an email custom audience, for example) or page fans before putting it in front of a much larger audience. Once your ad has collected its share of likes, shares, and favorable comments from your trusty base, you then repurpose the ad (with all of its likes, shares, and comments intact), using whatever objective you choose. Look at a negative comment as an opportunity to politely set the record straight or to address an objection that many others, including those reading your ad, may have had or will have. This does a couple of nice things: 1) Your larger audience is more likely to respond favorably to something that has already gotten a lot of favorable response (the “laugh track” effect) and 2) If someone does decide to get medieval on your product or service, your posse of brand advocates, the ones who liked, shared or commented earlier, may defend your product or service before you ever have to step in. Unlike some other social ppc platforms, Facebook does give you a nice range of options for dealing with those comments you would prefer not to have following your ad around. Below are some things for you to consider. Ideally, you want to respond to negative comments — or at least the ones that aren’t coming from an obvious troll. Look at a negative comment as an opportunity to politely set the record straight or to address an objection that many others, including those reading your ad, may have had or will have. This is where the PR gene comes in handy. Get good at turning a negative into a positive. Acknowledge the legitimacy of the comment first, of course. And don’t simply blast out a talking point. And be sure to keep your response in the brand voice. This is related to the tip above. Sometimes it’s best to move the discussion out of the comments section to a more private venue. Tell the person with the problem or beef to DM you or point them to your contact info. This isn’t just true for negative comments but for tangential or topics irrelevant to the product or service being discussed. If you’re advertising non-stop flights to Seoul you don’t want to be discussing the whereabouts of someone’s luggage in Louisville. This is an great feature of Facebook’s that allows you to simply hide the comment from the ad’s comment section. The comment itself remains viewable to the poster and the poster’s friends but no one else. But be very careful with this. If someone notices you’re hiding comments, particularly if they are legitimate criticisms of your product or service, that might signal a lack of transparency on your part and could wind up doing more harm than good. But hiding comments is an effective way of dealing with trolls, spammers and others who are simply out to discredit your company for no apparent reason. If you want to get rid of the comment altogether, you can simply delete it. This may anger the poster more than if you had simply hidden the comment, in which case the poster wouldn’t be aware of the censure. Again, I would only do this if you had a legit reason — something serious and not just a casual criticism or unfavorable opinion. One of the more common strategies, as mentioned earlier, is simply to respond to all reasonable comments and ignore all the unreasonable ones. Don’t allow yourself to get into an argument with a troll. That will only inspire other trolls to get into the act. Yeah, sounds weird, right? But there are no comments on a Right Hand Column Ad. Personally, I think RHC ads are perfectly fine for some objectives. They are Facebook’s version of a banner ad so lower your expectations accordingly. There are some other “nuclear” options, such as banning users and/or using keywords to filter comments, but the options above should be more than enough to help you control the situation. I like to think of Facebook as a kinder, gentler place to get your social PPC on rather than, say, Twitter, because there are far fewer anonymous accounts and people tend to behave better when their real name is attached to their account. And Twitter doesn’t let you hide comments or anything like that, so you’re at the mercy of the platform. But, again, the good news is you have all the tools you need to feel like you have a reasonable amount of control over your messaging. Did I miss anything? If so, drop me a note in the comments below or send me an email. Thanks for reading and happy advertising.